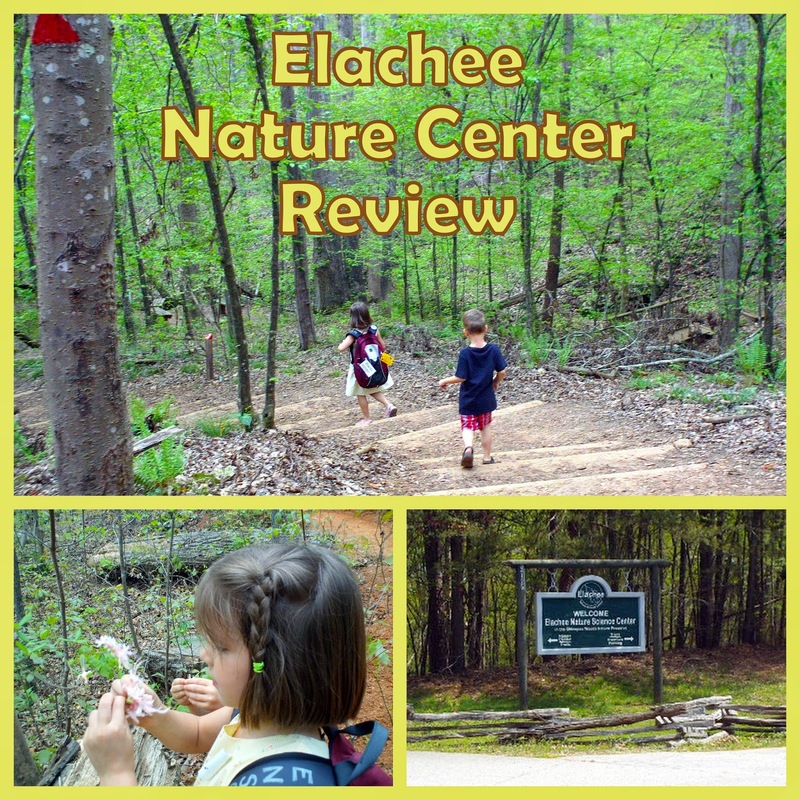 Elachee Nature Center is an beautiful nature center located in Gainesville, GA that we stumbled across one day while running an errand in Gainesville. It is located in the 1,500-acre Chicopee Woods Nature Preserve. 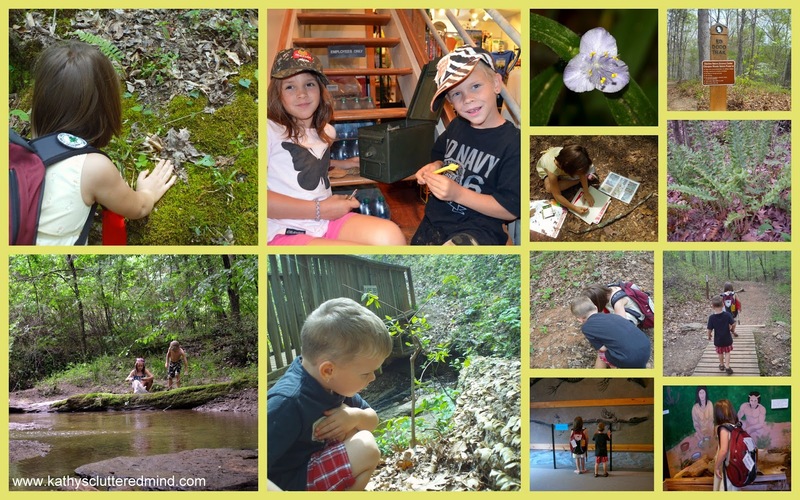 This place is a nature lovers paradise and is definitely one of our favorite nature centers in GA.
We are avid hikers and geocachers so we are always on the search for trails to explore. Well Elachee offers that and so much more. There is a fee for the museum which houses the exhibits and discovery areas, but the trails are FREE to walk. Since this was an unplanned field trip we didn't have our nature backpack which we normally take with us on hikes. But that was okay because they have awesome "Discover Nature Packs" you can borrow for FREE (they do require you give them your drivers license as collateral). The backpack was filled with paper, writing utensils, books, field guides and more. There is even a Gecoaching GPS Backpack. (Update: on one of our return trips we checked out the GPS pack and had a blast. The children were able to solve the clues to unlock the cache). After walking around the museum we took a nature walk on the short unpaved Ed Dodd Trail. We saw wildflowers, inchworms, lots of butterfly's, spiders, all sorts of trees, toadshade trillium, fungus's and mushrooms. The kids had a great educational day. My son traced some leaves and my daughter drew and wrote in a mini nature book that we made by folding a piece of paper in half. We learned all about lichens from one of the field guides in our bag and tried to locate the different kinds during our walk. After we finished the nature walk we checked out the butterfly garden which was just starting to grow. Hopefully next time we visit it will full of pretty flowers and butterflies. On the way back to the car we checked out the compost center they have set up. They also have some brochures and coloring pages about composting that you can take home with you. Since we spent so much time at nature center we did not have a chance to check out the Chicopee Woods Aquatic Studies Center and Chicopee Lake which is located across the preserve from the main complex. You can access the Aquatic Center by either a 2.5 mile hike or a 10 minute car ride around the perimeter of the preserve. The lake and surrounding wetland provide a perfect spot for the study of pond life, wetland inhabitants, and birds, who favor this site as home or a stop on their migration route. Some of the photos are from a recent trip. Elachee's mission is to promote environmental understanding through education and conservation. Some of the ways Elachee does this is by offering teacher education, summer day camp, special public programs, scout and home school programs, children's birthday parties, and facility rentals. Elachee's curriculum is designed to develop a healthy ecological consciousness and includes preschool. elementary, and secondary education programs paralleling the Georgia Performance Standards. Elachee is a private not-for-profit 501 (c)(3) institution and is supported by program fees, memberships, fundraising events, museum admissions, and donations from corporations, foundations, and individuals. The kids beg to go to Elachee anytime we are in Gainesville. They love the hands on exhibits, live animals, trails and creek. My daughter says her favorite animal at the nature center is the corn snake. And my son says he loves the red tail hawks they have in the outside enclosure. Dress for the weather and make sure you were good walking shoes. I highly recommend keeping the flip flops at home. Bring water if you plan to walk the trials. Make sure the kids use the restroom before you head out on the trails. Don't forget your good camera (like I did) there are some beautiful things to take pictures of. Remember there are snakes in the woods so make sure you discuss with your kids about not touching or picking up ANY snakes. Especially since GA does have a few venomous species. Don't forget to pick up a trail map which are located just outside the front door of the museum building. Check out the boards just inside the museum entrance for information on what types of flowers are currently blooming. If you want to make your visit even more educational and memorable be sure to check out the Discover Nature Pack in the museum lobby. These backpacks, which are FREE to check out for the day, contain lots of information, nature guides and fun activities to help you explore the woods using Leave No Trace guidelines. These backpacks are geared toward grades K-8, pack themes include animals, plants, and GPS (Global Positioning System) navigation. A combined animal/plant backpack is available in Spanish. Sponsored by a grant from REI. Make sure you check out the events page on Elachees website to see if there is anything going on. Make sure your children know not to pick the wildflowers or collect plants, animals, rocks or other natural materials. If you wish to take your family dog you can do so during permitted hours if they are on a leash. They are not permitted Monday through Friday from 9 am - 3 pm due to school groups.